The Penguins sent a message to the New York Rangers on December 20. While they may be battered and broken, their fight is as string as ever. That message of resiliency and will power came loud and clear as the Penguins routed the Rags 7-2. The Penguins will be riding on that high going into Thursday's game versus the red hot Columbus Blue Jackets. (Yes, typing that felt very weird). With a depleted defense, the club called up Chad Ruhwedel from Wilkes Barre on December 17 to play with Derrick Pouliot and Steve Oleksy. Ruhwedel had been called up once before earlier in the season, but did not see any playing time. 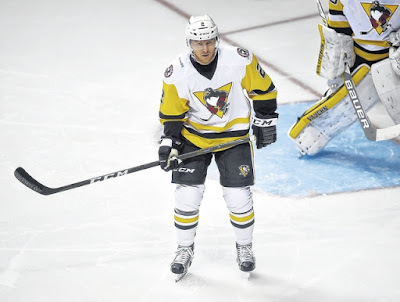 Now, he boasts the WBS Penguins second-highest point count among defensemen with 13 (three goals, ten assists), over 26 games, earning him the nod once again. With Oleksy getting the scratch for the night, Ruhwedel would see himself with Pouliot on the third defensive pairing, moving the duo of Justin Schultz and Ian Cole up to second. Though playing in his first game, Ruhwedel would end up overshadowing his more experienced counter part. His fast skating as well as possessing a offensively-minded play fits in well with the Penguins style. It also helps to have another right-handed shot to utilize. Ruhwedel was able to get into the offensive zone on a few occasions during his sixteen minutes of ice time. He would even be fed a prime scoring opportunity from Phil Kessel, but could not elevate the puck past Rangers net minder, Antti Raanta. Overall, Ruhwedel made sure to get noticed in his first game on the NHL level. It will be interesting to see how he is utilized going forward during his time with Pittsburgh and if he will continue to play with the same positive force. As impressive as Chad Ruhwedul was against the Rangers, Derrick Pouliot was equally as un-impressive. I understand he is Mike Sullivan's "project player", but how much longer does the truth have to glare you in the face before something is done? To put it as bluntly as possible: The kid needs to be let go in order to given the opportunity to (hopefully) thrive somewhere else. It just isn't working here in Pittsburgh (or in Wilkes Barre) the way everyone (staff and fans) had hoped. He has made no advancement in his play offensively since his years in Juniors, and his defensive play has stalled, or at times, become worse. Pouliot played a whopping 10 minutes, 45 seconds versus the Rangers and it came in a very sheltered role. Every single one of his starts on ice came in the offensive zone proving that the coaching staff still have zero confidence in his defensive growth. Pouliot made turnovers in both the offensive and defensive zones (thank goodness for Matt Murray or one turnover would have meant a goal for Rangers, Jimmy Vesey). He also took a senseless tripping penalty early in the second period. I won't muster a guess as to why Pouliot was given the start over Oleksy (perhaps the coaches hoped that magic would spark on the anniversary of Pouliot's first NHL goal two years prior?). 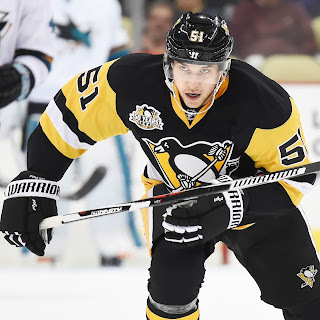 With the Blue Jackets on a ten game wining streak, defensive mistakes can and will be costly so the Penguins are going to want the best they can get on the ice and Derrick Pouliot isn't it. I am sure he is trying, but a change of scenery can work to a player's advantage so maybe that really is what is needed. Justin Schultz and Bryan Rust continue to have a December to remember. Schultz continued rubbing salt in the wounds of Edmonton with another multi-point game against the New York Rangers. He had a total of 21 minutes, 39 seconds of play with a goal and an assist. Rust has been nothing short of a machine. He now has nine goals (six in the month of December alone) and was promoted to play first line along side Sidney Crosby and Conor Sheary. Rust's versatility, speed and scoring ability is continuing to prove doubters wrong. Patric Hornqvist snapped a 9-game goal-less streak putting one past Raanta for the Penguins sixth goal of the night. In the same realm, Carl Hagelin continues to try and find the back of the net. He has only two goals in the past twenty-one games going back to November 8 against the Edmonton Oilers. He was reunited with Nick Bonino and Phil Kessel on the HBK-Line and has had some fantastic looks on net, but nothing is going through for him right now. Here is hoping this is just a little mid-season slump and that he will return to scoring form sooner rather than later.